What: The 68 Blocks reporting and editing team from the Boston Globe present their multimedia series on the Bowdoin-Geneva neighborhood. How to attend: Please RSVP. *THIS EVENT IS NOW OVERSUBSCRIBED. “This is a beautiful, wonderful, stinking, nasty, crazy, violent, peaceful, loving, and full community. All in one. And I love it.” – Boston Globe journalist Meghan E. Irons quoting a rapper from the Bowdoin-Geneva neighborhood in Dorchester. 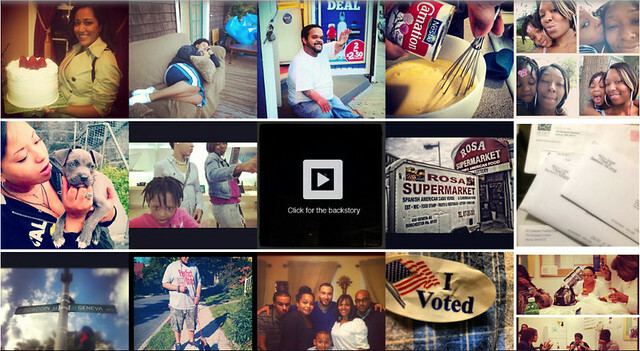 On this Instagram feature you can click on each image to hear the photographer explain her photo. What’s the first thing you do when you set foot in a new neighborhood? Do you learn through your camera lens? Do you talk to the people? Do you get a meal? Maybe you did your research, and you know the landscape or the history. Are you ready to let the neighborhood prove your research wrong? 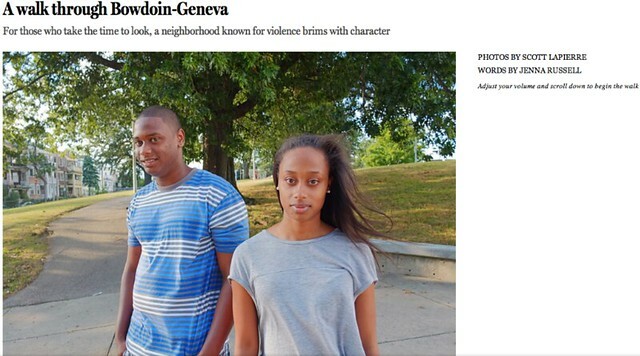 In 2012, the Boston Globe undertook a year-long effort to understand the Bowdoin-Geneva neighborhood of Dorchester. For decades, journalists have been reporting shootings and homicides there – rushing to crime scenes and then leaving to file their articles on time. The Globe wanted to tell a more complete story of the neighborhood. 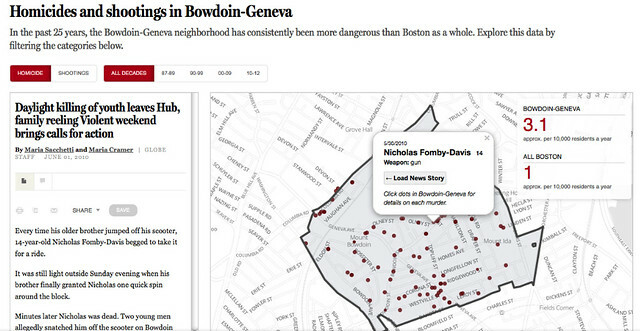 The Boston Globe mapped articles it has published about homicides in Bowdoin-Geneva between 1987 and 2012. The map includes shootings as well. Two journalists – one of them originally from Dorchester – moved into an apartment in Bowdoin-Geneva in the Summer of 2012. With the help of videographers, photographers, data journalists, multimedia producers, editors, and fellow reporters, they spent a year learning this neighborhood. Learn what they did and how they did it at this open MIT event. If you can’t attend in person, check out the live blog at http://civic.mit.edu/blog. Hear the sound a summer afternoon in Bowdoin-Geneva via this audio-visual feature.